Fay hits Gainesville The current center location on the map is almost exactly at Gainesville. Fortunately, Fay was just heavy rain and strong winds. The storm started yesterday afternoon, and officials announced that UF and the public schools would be closed today. A storm day! Growing up in East Tennessee, we had snow several times every winter. When snow was forecast, we students would eagerly await the word on whether we’d have a snow day. My mom would call these snow days “found time.” Dad was an elementary school principal, so he still had to get to school at some point during the day. Mom was a teacher, and I was in school, so we both had “found time.” With UF starting on Monday, I have plenty to keep me busy during this “found time” today. Too stormy to go into the yard to collect fallen branches. 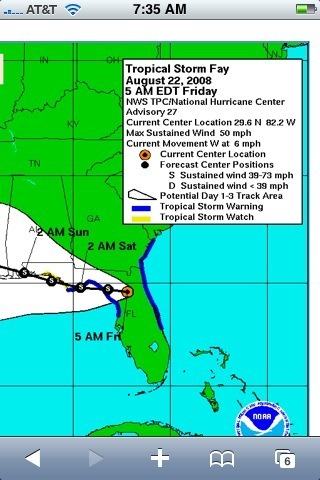 The current center location on the map is almost exactly at Gainesville. Fortunately, Fay was just heavy rain and strong winds. The storm started yesterday afternoon, and officials announced that UF and the public schools would be closed today. Growing up in East Tennessee, we had snow several times every winter. When snow was forecast, we students would eagerly await the word on whether we’d have a snow day. With UF starting on Monday, I have plenty to keep me busy during this “found time” today. Too stormy to go into the yard to collect fallen branches.